There is a new breed of altruistic professional - the social entrepreneur. They are not upwardly-mobile whiz-kids but the new face of socially responsible UK Plc, running firms that tackle social or environmental issues while turning a profit - however small. These enterprises contribute a surprisingly large amount to UK growth adding £8.4bn a year to the economy, according to government data. 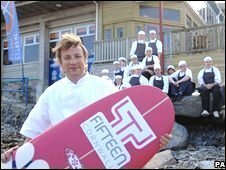 Some are familiar brands: fair-trade coffee firm Cafedirect, Cornwall's Eden Project, Co-op Bank and Jamie Oliver's restaurant Fifteen which helps out socially-excluded youngsters. And while smaller firms may not be as famous, they have carved out their own niche. 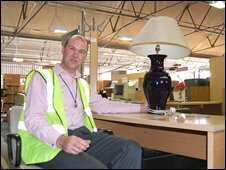 Take Green Works, which collects unwanted office furniture from big companies like Marks & Spencer and recycles it to sell at a discount. Desks, chairs, coat-stands and unloved Yucca plants are spirited away to one of its six London warehouses - for a fee - to be sold to schools, colleges, charities, housing associations and small businesses. As its motto is "waste nothing," what cannot be sold is dismantled and recycled. It's a sustainable business plan that recently landed the firm a coveted Queen's Award. At the entrance to the company's west London site, founder Colin Crooks begins a guided tour of his Aladdin's Cave with a 40-foot lorry that has arrived from Royal Bank of Scotland. It is one of six lorries, each packed with 12 tonnes of office furniture. Inside the site is a maze of royal blue chairs, at least 100 carrying a sticky label revealing their former home - oil giant Shell. This furniture graveyard shows how much is discarded by big business. There are even enough beige carpet tiles here to fill a football pitch, the owner claims. In a corner, two young men dismantle a desk while another worker hammers dowels into freshly cut chip-board to make storage units. Some of the carpenters here are former prisoners given a chance to retrain, the foundations of the social enterprise. Helping people from marginalised communities, the homeless and long-term unemployed, as well as looking after the environment, are Mr Crook's founding goals. But altruism in business, he admits, can be challenging. "Some employees find it hard to understand we're not making things to give away. We have to behave like a serious business." Near the end of his tour, the Green Works founders parks himself on a plush, cream swivel-chair. "Ooh, look. We got this from Rothschild- just feel the fabric". He is genuinely pleased that a chair that once supported a great banking boss might soon furnish a fledgling firm. "Look at this stuff. Why on earth would anyone want to get rid of it?" He has a point - the UK generates around 100m tonnes of waste a year from households, commerce and industry, according to government figures. Since 2000, his business has taken more than 60,000 tonnes of furniture that would have ended up in landfill. Meanwhile, schools, charities and small businesses have saved around £2.5m buying from Green Works. Even damaged goods are given a new purpose, with chip-board sent off to a specialist plant to be converted into fuel pellets for German and Belgian power plants. But the process is costly, leaving a balance sheet that would make a finance director weep. Social enterprises, by their nature, are not very profitable because at least 50% of profits must be re-invested in the core areas it supports, according to the body that looks after the sector the Social Enterprise Council (SEC). 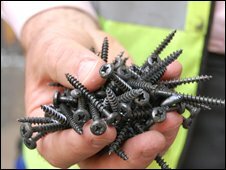 Green Works' turned over £2.1m in 2007, but its costs were almost the same. "I'm here to stop furniture filling up landfill, not to boost profits so I can holiday in Barbados," says Mr Crooks. On top of slim margins, another characteristic of the social enterprise is its worthy goals. "Many businesses claim they have ethical objectives, but social enterprises are distinctive because their social or environmental purpose is central to what they do," says self-confessed "serial social entrepreneur" Kim Stoddart. Ms Stoddart founded Green Rocket, a consultancy that helps other small firms promote their green credentials. Green Rocket says it ploughs 75% of profits back into social causes, compared with a sector average of around 50%. Social evangelists, like Kim and Colin, believe they are changing perceptions of the way businesses work. While many people believe Corporate and Social Responsibility goals set out by big name firms are mere window dressing, Ms Stoddart believes the social model is different. "Social enterprises have to make a difference from the outset. I had to commit to re-investing profits in the social aspect of my business, in my case education." Even in these uncertain economic times, she believes this new business model is attracting more and more of the country's budding start-up stars. "There's been a big focus CSR and philanthropy - big businessmen like Bill Gates helping others after they made millions," says Kim. "But small firms have neither the money nor the time to go down this route," she adds. And as storm clouds gather over the UK economy, 2008 will be a testing year. The social entrepreneur must somehow bring together two opposing forces: being selfless and profitable. But attitudes are changing according to the Social Enterprise Coalition (SEC). "Ten years ago, I had the door shut in my face by the government. Now there's a wider understanding at political level," says SEC chief executive Jonathan Bland. But he admits hurdles remain for the aspiring entrepreneur, particularly surrounding investment. "The credit crunch will make it harder for our members to get cash. But it will be doubly difficult as they can't raise money through conventional routes," Mr Bland explains. However, years of campaigning is finally paying off with the looking at new investment models for these enterprises, says the SEC. There has even been talk of creating a social stock exchange, a kind of ethical bourse where entrepreneurs can raise money. Cafedirect is one of the few firms in the sector that has issued shares, it raised more than £5m through a rights issue in 2004. It is unlikely we will see social shareholders becoming mainstream players in the financial world any time soon, but Mr Bland predicts the businesses of the future will have both flavours. "In 10 years, you will see a new model that blends the social enterprise and the existing business based on traditional shareholders," he said. Back at Green Works as Mr Crooks' tour ends, the green champion dashes off to 11 Downing Street to have tea with the Chancellor and a women's enterprise that helps get mums back to work after having children. As he leaves, one of his workers sneaks off to the tube station. "I know, I know. I should cycle, just like Colin." It seems that the altruistic business model is gradually changing the mindset of the public, employees and the government. How effective is social enterprise?